Since coming to Paul Smith’s College in 2012, I have developed a deep interest in the local food movement and sustainable agriculture. It’s more than just knowing where your food comes from – it’s also knowing how it’s grown, and who is involved. I think many students here at Paul Smith’s College are interested in learning more about how their food comes to be: from farm to fork. By far, the best way to do that is by volunteering at local farms. Many local farms are looking for eager, hard-working folks to come out and offer their time. In return, you are usually offered farm products like veggies, cheese, bread, or meat. 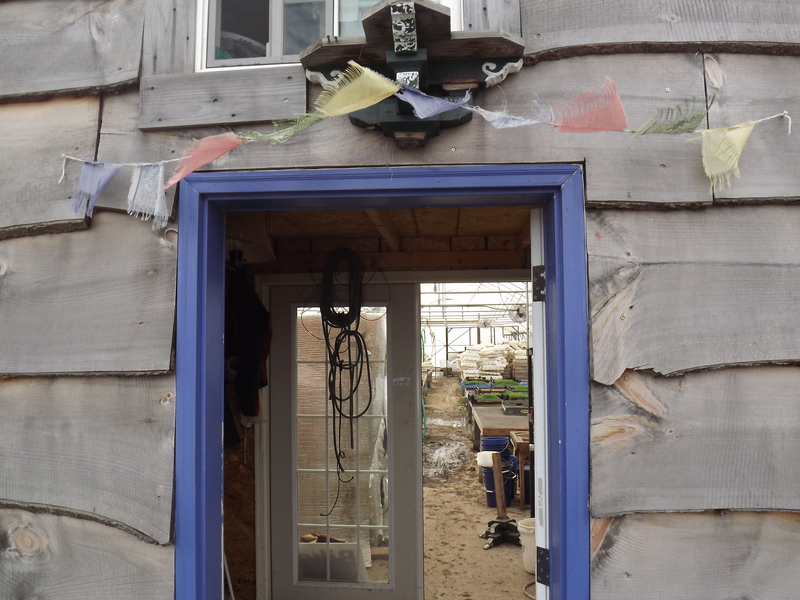 A great way to get started in farm volunteering is through the organization WWOOF. WWOOF stands for Willing Workers On Organic Farms. Quite simply, it’s a service that connects willing volunteers with farms that need help. 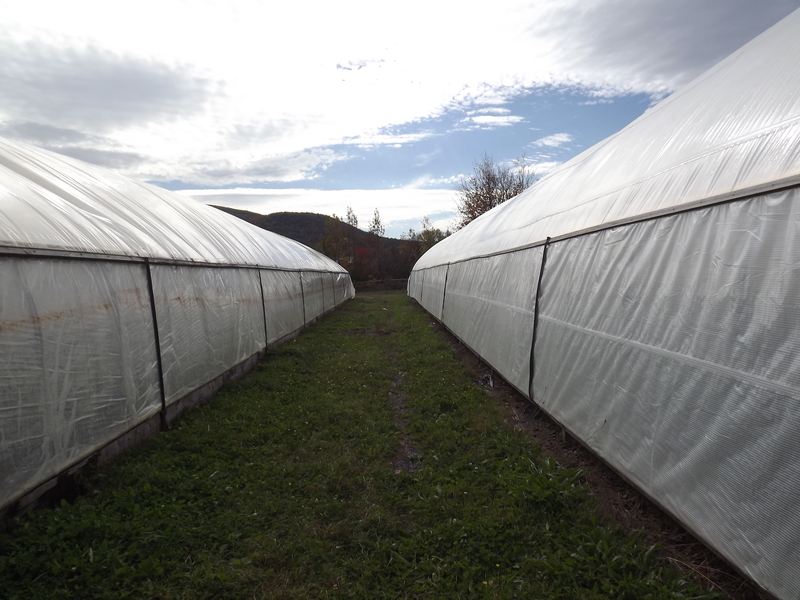 On the WWOOF USA site you can create a profile complete with your bio, availability, and a picture. You can then search farms and see details about the farm, who they are looking for, and whether or not they will provide you with meals and a place to stay. 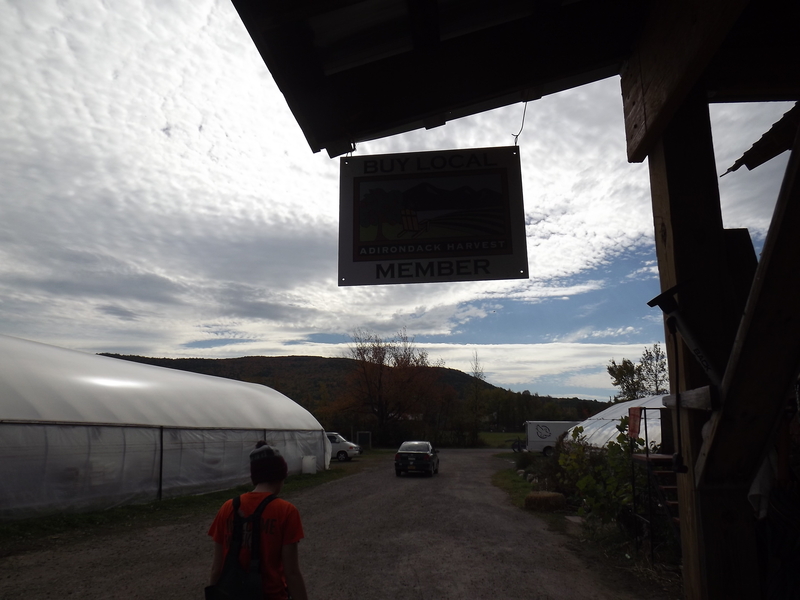 My first adventure was at a farm located in Keeseville, NY – Fledging Crow Vegetables. The first day on the farm, we picked peas. Our friend Peggy showed us how to turn the bushes over to reveal the large green pods. We each took over a row and worked methodically down the row, turning over each bush. 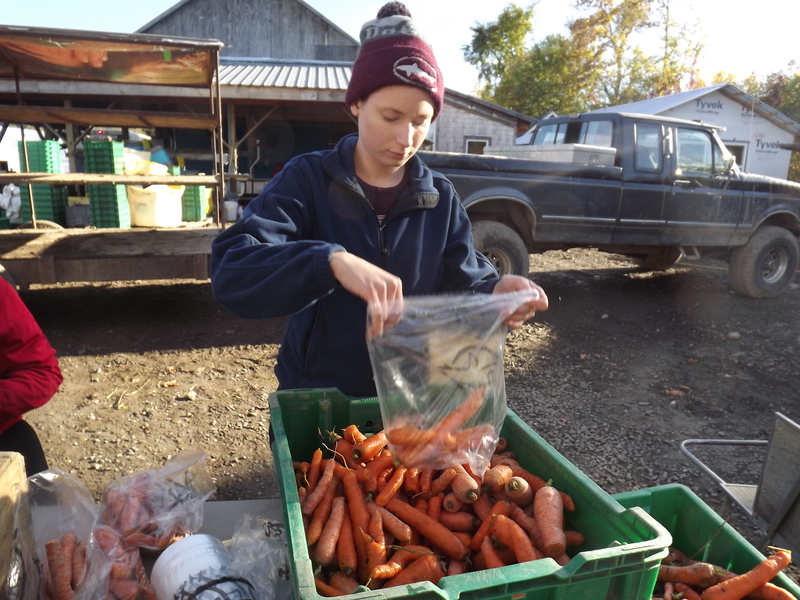 After filling our bins, we switched over to the task of packing carrots. 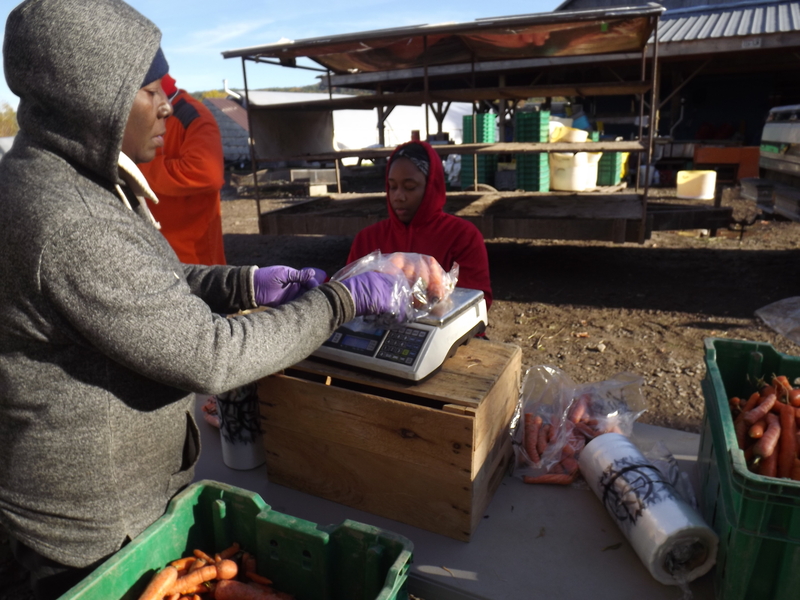 The carrots had been harvested prior, and our job was to weigh them out into individual 2lb bags, then slip a rubber band over the bag. While this task was certainly repetitive, it was oddly satisfying to see the bags stacking up and covering the wooden pallet. Almost everyone I met on the farm was from a different place, from Jamaica to the Bronx. Some were there for 1-3 weeks, some for the entire season, and each had their special stories and personality. Everyone was very friendly. 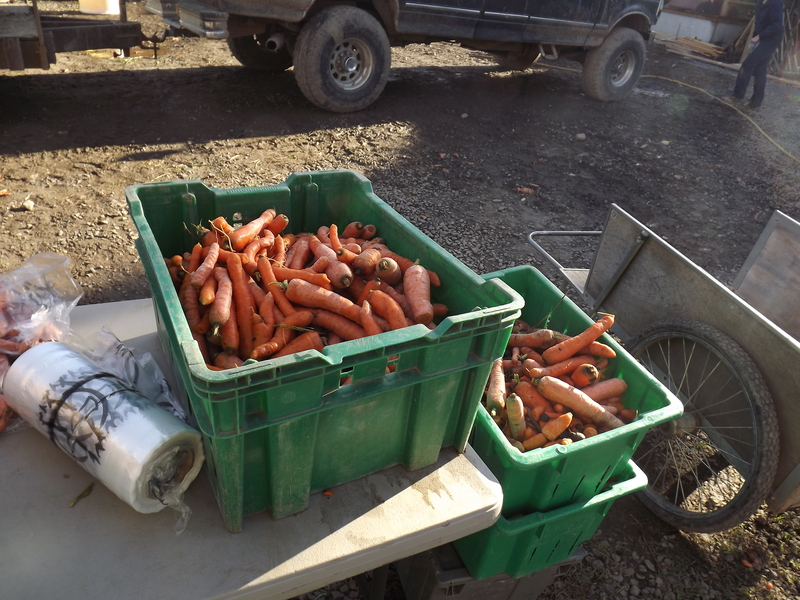 The second day was a lot like the first: carrots – tons of carrots. We packed up a huge order that was going to head out to Rochester to fill a 1,400-person CSA! Wow! The day wrapped up early, and I was able to visit Ausable Brewing for a big rack of ribs and an IPA. The last day I tried my hand at a few more tasks. We picked, processed, and bagged carrots, beets, and celeriac. In front of us, a tractor with an attachment pulled through the bed of root vegetables. It loosened the earth below the vegetables, allowing them to be pulled free easier. The beets pulled out very nicely and we created piles, which we then loaded onto a truck and brought back to the home farm. We did the same with the carrots. The celeriac, however, was a different story. Celeriac is a beautiful root vegetable with a knobby, white, softball-sized bottom that grows under the soil, and a green, leafy, celery top with a distinct aroma. Celeriac tastes amazing when prepared, like mashed potatoes, but while in the ground, celeriac’s long roots make it very difficult to pull from the soil. Let’s just say, these guys hold on for dear life, and then you have to hack off all their woody roots before they are ready for sale. Once back at the home farm we feed the veggies through “THE TOPPER,” this mammoth of spinning metal that rips the tops off the beets, carrots and celeriac. Then, the vegetables take a short trip through the washer – a churning chamber of water that removes all the dirt and rocks. Following this process, the now-clean vegetables are bagged and head to the cooler for storage, until they eventually make their way to the consumer. My first weekend of work was such a good time that I went back again the next weekend. It was a learning experience just to see a full-scale farming operation in motion. Getting my hands on the vegetables and dirt, and seeing the process and tasting the food, taught me more about my food than anything else could have. I was surprised at how strong I actually am, and how much a team can accomplish in a day. If you’re interested in learning more about farming – and meeting lots of great new people – don’t be shy, get out there! Trust me; it’s worth your time. Check out the Apollos for more stories!